Prepare the salsa verde: put the garlic, herbs, capers, if used, and lemon juice into blender with 30ml/2tbsp olive oil. Blend together until coarsely chopped. Heat the remaining oil in a pan and cook the steaks for 2-4 minutes on each side. Lay the steaks over the salad and top with the remaining bread. 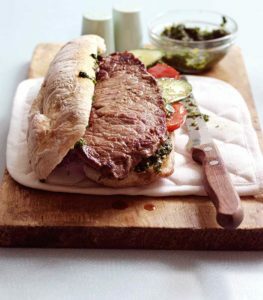 Spread the salsa verde evenly over the bread and garnish with the cucumber and tomato slices. Serve immediately with chunky chips. Store any remaining salsa verde in the fridge for up to 3 days, or for extra speed use a jar of prepared salsa verde or pesto sauce. Try this recipe with cooked roast beef or your favourite bread.